The Exacompta Sketch Book One of the most versatile products I've ever found. 100g off white laid paper that takes fountain pen ink, markers, and watercolor paints. 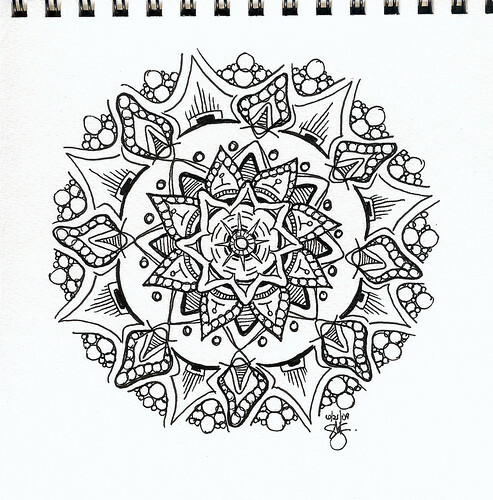 Blank Paperblanks Journals - The off white paper is great for use with fountain pen ink and I love to doodle on this paper. Clairefontaine Spiral Watercolor Pad - Square spiral bound 300g cold pressed watercolor paper is perfect for making mandalas with any number of different types of media. 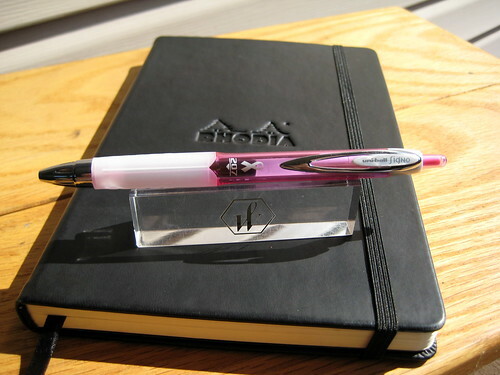 Rhodia Meeting Book - I love the format and the small version is my absolute favorite Rhodia product. 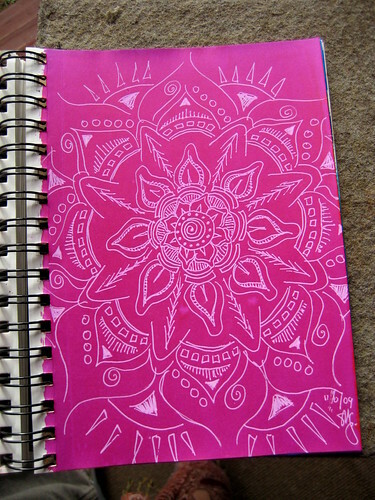 Fabriano Classic Artists Journal - The large version is one of my favorites for drawing pen & ink mandalas. Myndology Disc Bound Journal - Love the size and the ability to rearrange the pages is priceless. Lamy Safari Fountain Pen - What can I say? I have 6. I love them. Sailor Sapporo Fountain Pen - The Sapporo is the perfect weight and balance for my hand. Lamy Accent Fountain Pen - A few $ more than the Safari, the Accent is a slightly heavier pen with grown up looks. Though the nib is the same as the Safari, the extra weight on this pen creates an even smoother ride. J. Herbin Perle Noire Ink - Between all 3 Diamine black inks, Sailor Black, Sailor Nano Black, Pelikan Black & Noodler's Bulletproof Black, this is the darkest & blackest ink. Diamine Onyx Black Ink - Very close to the Perle Noire but slightly better behaved. Diamine Poppy Red Ink - After trying bottle after bottle of red ink, (too pink, too orange, too light...) I have found my all-time favorite red ink. Albrecht Durer Watercolor Pencils - Seriously pigmented and extremely versatile, these were a very good investment. 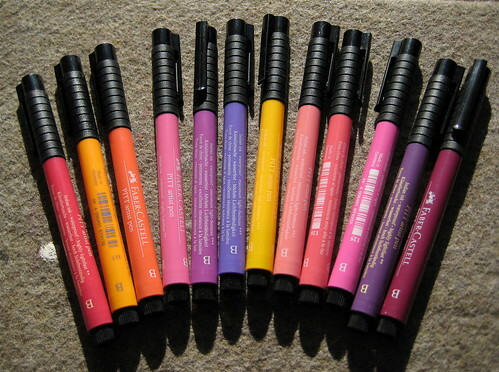 Pitt Artist Brush Pens - Flexible nibbed markers using a permanent India ink. 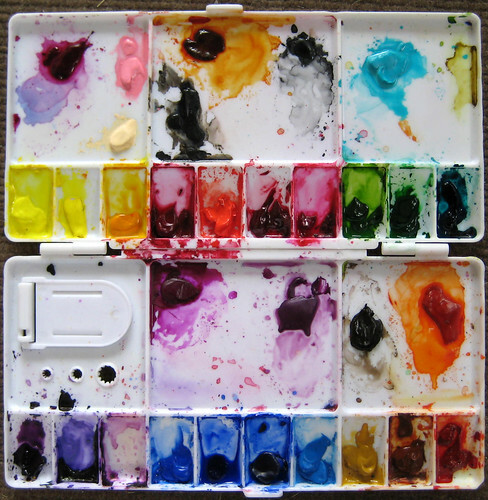 The colors match beautifully to my artist grade watercolors. Uniball Signo Broad White Gel Pen - The most perfect white gel pen I've yet to find. Uniball Signo .7 Gel Pens - If I'm not using a fountain pen, I reach for one of these. Very smooth and they come in lots of cool colors. 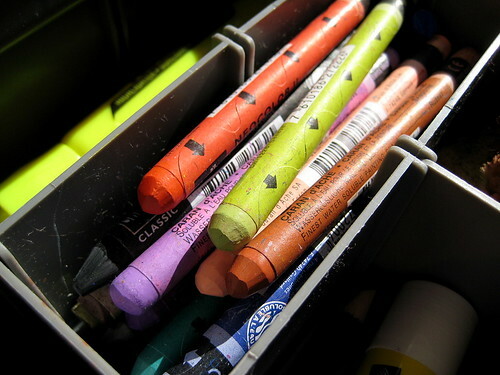 Caran D'Ache Neocolor II Watersoluble Crayons - Crayons for grown ups. 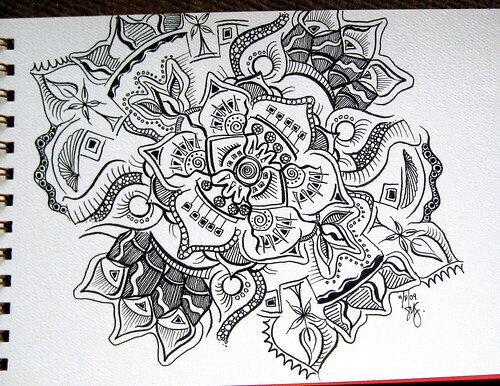 Great on colored paper, can also use with water. Late to the Game: Tombow Calligraphy Pen - This pen has a short firm brush nib that works perfectly on my typically smaller pieces. And that's it for 2009! See you next year! I have a Lamy Safari, and I love it...which I requested based solely on your reviews. Thanks! I love this post! I would absolutely agree with the Exacompta sketchbook, the neocolor crayons and Pitt Pens, and I too love my Safaris and Sapporo. I'm looking forward to trying the CF square book and Albrecht Drurer pencils some time - I really like watercolor pencils, but I've never found this particular brand up here. Thanks as always for your fabulous reviews! All excellent choices on the Art Supplies recommendations. Happy Birthday & best wishes for 2010!